We've been waiting years for this moment, and it looks like Qualcomm will be the first one to deliver on our dreams: fingerprint scanners that go directly underneath your phone's display panel. At MWC Shanghai today, Qualcomm announced that it will be supplying these futuristic scanners - a new business for the company - starting in Summer 2018. Qualcomm's design utilizes the company's previously-announced ultrasonic fingerprint detection method. Because of its use of ultrasonics - as opposed to capacitance - Qualcomm says this fingerprint scanner design makes it much easier to "see" through your smartphone's display panel to take a fingerprint read... as long as it's not too thick. The catch is that Qualcomm's design will only work when implemented on an OLED panel under 1200 μm thick. That leaves LCDs out of the running. Qualcomm's sensor can even go beyond reading fingerprints, with the ability to detect heart rate and blood flow, something a traditional capacitive fingerprint scanner really isn't capable of. And yes, it works with the screen on or off - it doesn't matter. Qualcomm says its solution will be just as quick as fingerprint scanners on modern high-end smartphones, and it even works underwater, where capacitive fingerprint scanners are basically useless. Because the sensor sits under the display panel, there's also no hole that needs to be drilled into the device to add it in anymore, making producing a waterproof smartphone even easier. Qualcomm also announced two other basic scanner designs that utilize its ultrasonic technology and can be placed directly under metal or glass (but not under a display). Those scanners will begin shipping much sooner, with the under-display version arriving latest, as per the timeline in the image above. Interestingly, Qualcomm specifically points out that all its scanners will work with non-Qualcomm chipsets, potentially positioning Qualcomm very suddenly as a major player in the fingerprint scanner business. SHANGHAI—June 28,2017—At Mobile World Congress Shanghai 2017, Qualcomm Technologies, Inc., a subsidiary of Qualcomm Incorporated (NASDAQ:QCOM), today announced Qualcomm®Fingerprint Sensors, next-generation ultrasonic fingerprint solutions which bring new and enhanced features to the previous generation Qualcomm® Snapdragon Sense™ID fingerprint technology. 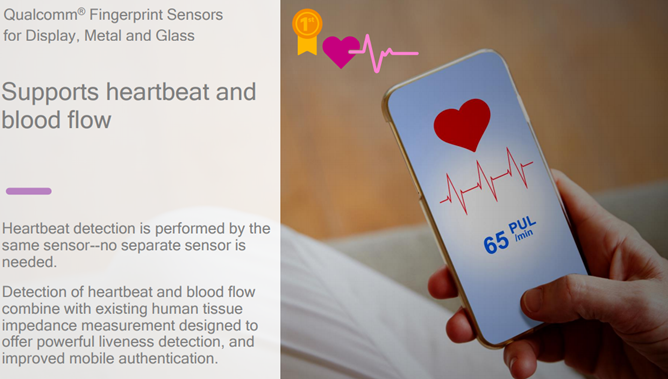 The suite of features consists of sensors for Display, Glass and Metal, detection of directional gestures, and underwater fingerprint match and device wake-up.It is also the first commercially announced integrated ultrasonic-based mobile solution to detect heart beat and blood flow for improved mobile authentication experiences. Qualcomm Fingerprint Sensor for Display is the mobile industry’s first commercially announced multi-functional ultrasonic solution capable of scanning through OLED display stacks of upto 1200um, along with enrolling and matching, and Qualcomm Fingerprint Sensors for Glass and Metal are the first commercially announced to scan through up to 800 μm of cover glass and up to 525 μm of aluminum, an improvement over the previous generation’s 400 μm capability for glass or metal. Qualcomm Fingerprint Sensors are designed as both an integrated solution with Qualcomm® Snapdragon™Mobile Platforms, and as standalone sensors that can be used with other non-Snapdragon Platforms. 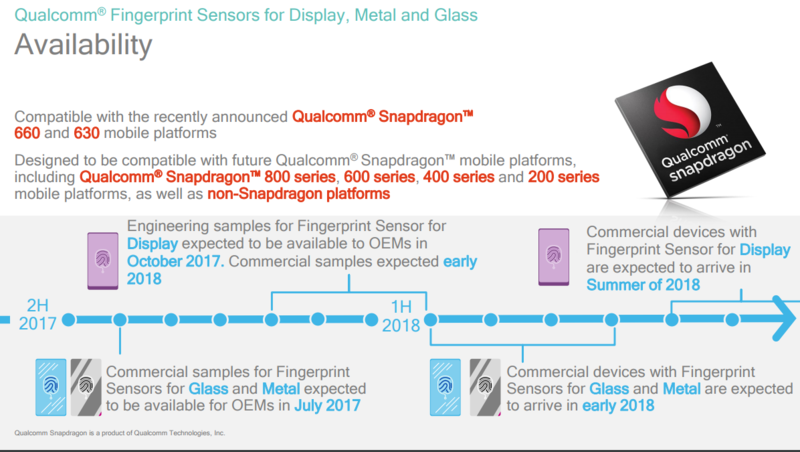 Qualcomm Fingerprint Sensors for Glass and Metal are designed to be compatible with the recently announced Snapdragon 660 and 630 Mobile Platforms, and Qualcomm Fingerprint Sensors for Display, Glass and Metal are designed to be compatible with future Snapdragon Mobile Platforms and non-Snapdragon platforms. The new suite of features, compared to the previous generation, supports more design flexibility for operators and original equipment manufacturers (OEM) by making it easier to differentiate products with unique form factors and advanced features and designs. Qualcomm Fingerprint Sensors for Glass and Metal are expected to be available to OEMs this month, and are expected to arrive in commercial devices in the first half of 2018. Qualcomm Fingerprint Sensor for Display is expected to be available for OEMs to evaluate in the fourth quarter of 2017. With Vivo Communication Technology Co. Ltd.,Qualcomm Technologies will be demonstrating Qualcomm Fingerprint Sensors for Display and Metal using modified versions of the VIVO XPlay 6.Qualcomm Technologies will also be demonstrating Qualcomm Fingerprint Sensors for Glass using a modified device designed for demo purposes only. All demonstrations can be found at Qualcomm Technologies’ booth W5.E90 (Hall W5) at MWC Shanghai.